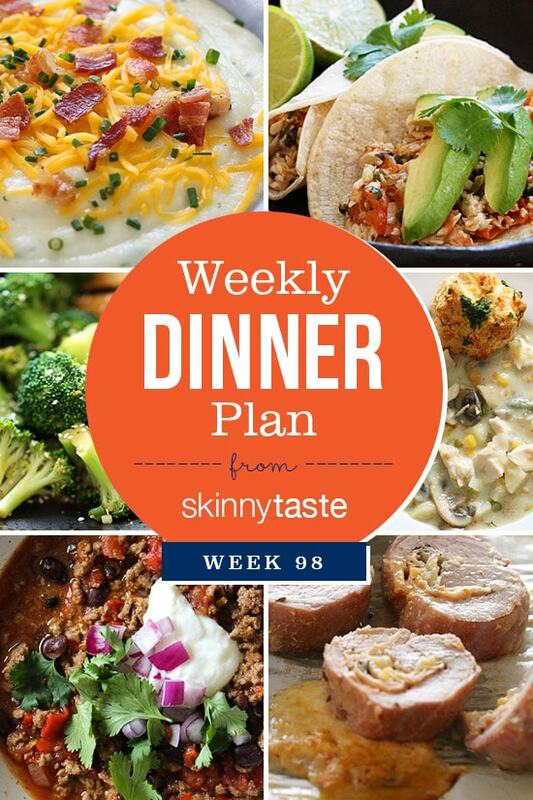 Skinnytaste Dinner Plan (Week 98). I’m on California shooting my third cookbook! In the meantime, I created this meal plan to for when I get back. What’s on your meal plan this week and is there anything you would like to see more of for the month of November? Wowie! I feel like I just hit the jackpot in Meal Plans! I am new to your website and can’t wait to try so many of these recipes. Can you share what your goal is in the meal plans? Are they based on a variety of types of food or by calories or just yummy looking meals for the week? I am trying to lose weight and just wondered if the meals for the week follow a special diet. Thanks for all you share! What a great resource and I can’t wait to return to your site!! Hi Kimber! Welcome! Most meals plans are just based on what looks good to me that week! Occasionally I will do a week of low carb, vegetarian etc…but mostly I try to mix it up! When is your new cookbook coming out? Cannot wait for the next cookbook!! So excited! Yah!!! Just did my meal plan for the week. You make it so easy. Thanks. My hubby is always excited when your recipes are on the menu. How exciting! When will your third cookbook be coming out? Your recipes are my favorite!! Yes, I was wondering the same. Can’t wait! Oooh I love the chicken pot pie soup! I’m loving your Instant Pot recipes- maybe some of the older recipes like this soup with Instant Pot directions? Thanks for helping us stay on plan! My husband and I have lost a combined 60lbs and usually make 3-4 of your recipes a week! Yes! I’ve been doing that slowly.